The Anster likes to go tramping (aka hiking) and often organises a weekend trip away with one or both of our boys. The last trip he organised was a during a very disorganised time for me, so he had to visit the supermarket to buy some ‘post-tramp’ snacks suitable to leave in the car (therefore not chocolate in case the day was a stinker and the snacks melted into a globby mess). The post-tramp snacks ended coming home again – uneaten for reasons I am not aware of. So that is how we happened to have a commercially made Raspberry Slice in the pantry. As an aside, I have real trouble spelling rasbperry…..). Sunday afternoon on a rainy day, out comes the Ticket to Ride Europe board game. Before X-box and PS2 entered our life, we had a board game ‘thing’. We picked up several really cool board games and they sit, mostly untouched & forgotten, in a corner of the living room. Everyone was keen for a game – even Miss M, as long as she could be the banker (yes, she has a few control-freak tendencies). The raspberry slice is cut up and some interesting chocolate quinoa cookies served along-side to keep our energies up while plotting our train tracks across Europe, blocking our opponents as much as possible without losing site of the goal. Unfortunately some (aye, Mopp) were so intent on blocking mum that they ran out of carriages to complete their task and left the younger brother to complete his run unchallenged. But returning to the raspberry slice – Mopp really really liked it so I offered to find a recipe for him so he could learn to make it (yeah, right). 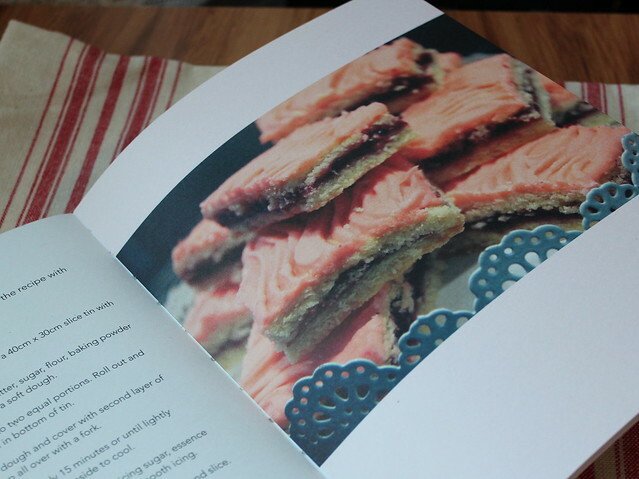 And as things happen, a new cookbook turns up in the mail from Penguin Group that happens to have a Raspberry Jam Slice. Knowing that Mopp wouldn’t make it, but if that I did and he tasted how yummy the home-made version was, that it might inspire him to “own” the recipe…. so I tested the recipe. 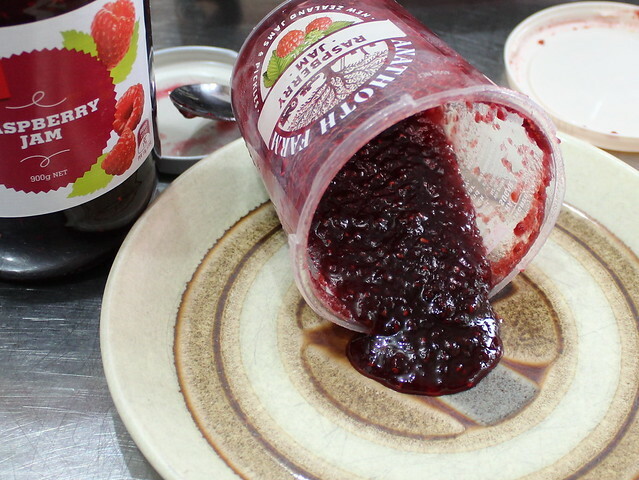 When purchasing the jam to make the slice in the first instance, I couldn’t bring myself to use just any raspberry jam. Our preferred commercially made jam is Anathoths or Te Horo (despite the fact they both come in plastic pottles when I much prefer to buy ‘things’ in glass…… the upside to the plastic pottles is that they are the perfect size to freeze 1 ½ cup portions of apple puree, home-made black beans or single portions of soup perfect for a weekday lunch). Unfortunately, as I got half the recipe ready before tea, and completed it after, I forgot to add in the baking powder, remembering only after the slice was half baked. I was also was a bit lazy (it was the end of the day), the method advises to roll out the dough…… rolling, phaff – I just halved the dough and pressed it into the tin, a much smaller tin than specified (40 x 30cm) simply because I didn’t have a tin that large. 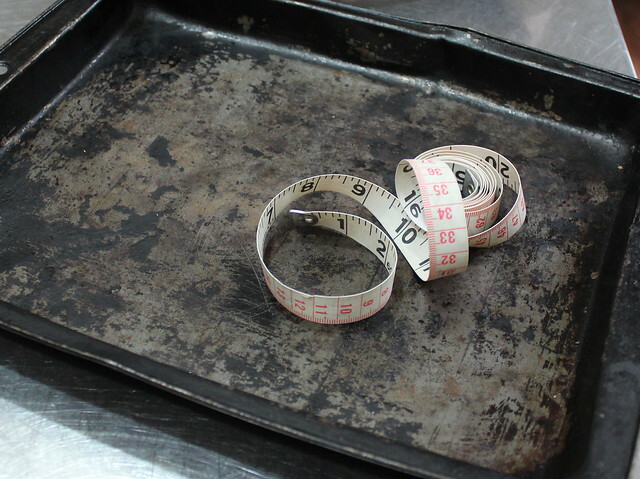 A trick I have picked up along the way is to keep a sewing measuring tape in my kitchen drawer to make quick and easy sizing of tins. Unfortunately sometimes I have to track down the tape since “mr nobody” has borrowed it and not put it back and really unfortunately I can only find my old old tape which is in inches so I have to do some quick mathematical calculations. The recipe is from Jas McPhee’s book: Feed a family of six for under $20. Our family numbers five – but the Mopp is 6 ft 1 and still growing and The Anster is 6 ft 4 ½ (the ½ is very important)….. so I really have a family of 3 ordinary adults and 2 giants. Actually, more like 1 short adult (me), 2 normal (in height) adults and 2 very tall adults….. I was looking for an RRP of Anathoths jam on their website and the recipes distracted me. It seems to be about $1.10 per 100g, while Pams was $.45 per 100g (that wasn’t on special). By using the more expensive Jam, my slice cost $7.75. I made it in a small tin, so I didn’t get as much final product but to buy a 300g rectangle of Raspberry Slice costs about $4.49 – I estimate my slice as being twice the size of the Ernest Adams slice – I will weigh it next time I bake it (with the baking powder this time) – I am still better off making the slice with the ‘flash’ jam than I am buying the pre-made slice. So by forgetting the baking powder, pressing the base into the tin (a smaller tin), spreading with flash jam, then sprinkling the remaining mixture over top and pressing down very slightly, and forgoing the pricking of the top – I didn’t exactly follow the recipe. I made the icing with natural red food colouring – which is probably about twice the price of artificial colouring. I bought mine from CakeStuff, an adorable shop in Hastings, Hawkes Bay that also sells almost everything you might need to decorate cakes. They also have Minion party stuff (Miss M is a 15 year old Minion crazy teenager – to the point she treats her younger brother as her own personal minion). I am just browsing their website now and I have found Apple Oil – which I didn’t see when I was in the shop. They also have a Raspberry Baking Emulsion and a Raspberry Oil – these could be options for flavouring icing. I didn’t see these either – I was looking for a natural raspberry extract as the more commonly available one leaves a funny after taste. I am still on the track of obtaining the raspberry flavouring so while waiting for the outcome of my enquiries, I ended up buying some artificial raspberry essence which I didn’t want to do but sort of ran out of ideas as to what I could use instead. Since then I have found many other options – natural red food colouring combined with Fresh-As raspberry powder would do the trick. Another option is to use a raspberry syrup – see my Raspberry syrup post. It was originally part of this post but the more I researched, the longer the post got and I decided to split it into two separate posts. I was a little heavy handed on the red colouring so the icing wasn’t pink but candy red – the boys loved it. I made the slice on Thursday night, iced it Friday morning and by Saturday afternoon it was gone. Mopp’s friend The Mattster probably helped a little as he is another teenaged giant with hollow legs. He was also very happy to taste test the first batch of ABC muffins I had made, I had to make a second batch as I decided they weren’t pretty enough to photograph so whipped up another batch. That was after I made a chocolate apple spice cake and got the mixture all mixed through and realised I had forgotten to sub out some flour with cocoa powder, so not chocolate after all. Hmmmm – that became an Apple Walnut Praline cake – I am going to make it again and sub some of the flour for walnut flour and see how that goes. 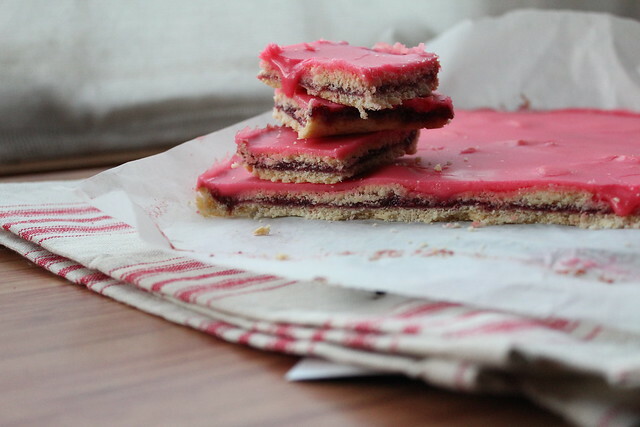 I am definitely going to have to make the Raspberry Jam slice again – as per the recipe, albeit with flash jam and natural red food colouring, so I can take a photo. I will also attempt to find a baking dish as close to 40 x 30cm as possible…..
Then the plan is to tweak the recipe – that is, sub the jam with a raspberry filling, courtesy of Kim Evans Little & Friday Shrewsbury Biscuit recipe on Bake the back page in Taste New Zealand magazine issue 100. And maybe try the icing recipe with raspberry syrup or Fresh-As raspberry powder. And, of course, attempt to photograph the slice before it gets inhaled by hungry teenagers. This entry was posted in Recipe Review, Slices & Squares and tagged Raspberry Jam Slice by Jo Dohrman. Bookmark the permalink.